« Did You Miss These? Pilot’s Iroshizuku ink gets tremendous praise for performance as well as beautiful colors and rightfully so. But what preceded this much admired line? Pilot and Pilot Namiki inks and they are deserving of recognition, too. With certainty I have been guilty of neglect. My bottle of Namiki Blue has had the same amount of ink in it for ages. Pilot ink hasn’t graced a pen here in years. 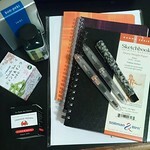 The colors are rather conservative and color is what sways me first when I match ink to pen. So they’ve been passed over to the point of being dumped in a junk drawer. When there are brilliant inks like Iroshizuku ku-jaku, shin-ryoku, and yama-budo, why would black, blue, or blue-black get called out to play? In a word, performance. To explore the idea that there might be something special about these inks, I took a tip from an FPN discussion and recruited some fine-flex pens for the task. First Pilot Blue-Black went into a Namiki Falcon SF. It took less than a sentence to trigger a eureka moment. Iroshizuku owes a great deal to its progenitor, Pilot ink. Then I searched high and low for that bottle of Pilot Black that had never been opened. It was not to be found. Maybe it deserted me for lack of use. However, I did locate a box of cartridges and popped one into the other Namiki Falcon SF. Black performed just as good as if not better than Blue-Black. Certain I was on to something, I had to find a pen with a similar nib for a three-way comparison. That wasn’t easy but an Esterbrook 9128 took up the challenge with Pilot Namiki Blue. So the writing examples won’t skew the results, note that the nibs are not identical though they are quite similar. The Falcon with black ink is the most fine of the three. The Estie comes in second but it is the most flexible. The Falcon with blue-black ink writes a tad wider than the others and has been the flex pen I have enjoyed the most for daily writing. The nib doesn’t dig into paper quite as much as the other two so it writes faster and with less friction. It’s been a good choice when a versatile pen suits the project at hand. Paper makes a difference and these inks did well on quality products like Rhodia and the Apica 6A10 used in the sample images. Feathering and fuzzy outlines ruled my Moleskine journal paper. Pilot ink fared better on copy paper showing just a slight fuzziness comparable to that seen with Iroshizuku asa-gao, shin-ryoku, and fuyu-syogun. Again, this is about performance and characteristics – not color. 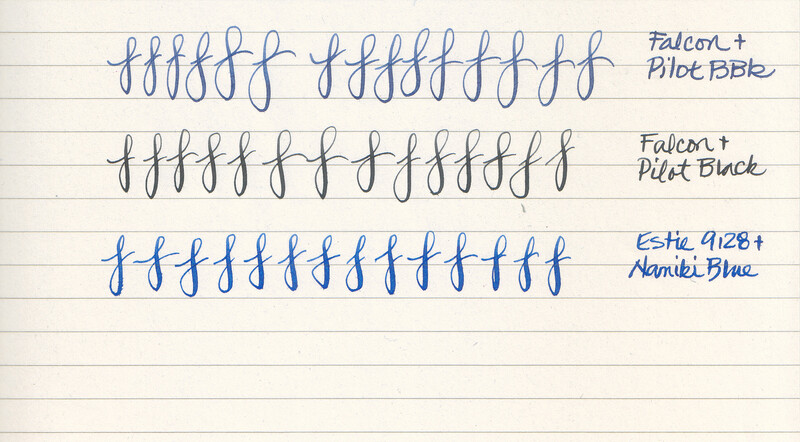 The flow from all three pens is consistent, smooth, and nicely lubricated. Not exactly the same as Iroshizuku inks but close enough to become staples for fine-flex nibs. The Pilot inks are especially well-suited to practice sessions when color would be a distraction. When conservative colors are necessary, they will also shine. All three inks dried relatively quickly despite depositing a substantial amount of ink on the down-strokes. In this regard the Pilot inks beat most of the saturated inks as well as some of the less saturated ones that I use the most frequently in my Apica 6A10 journal. I don’t use black ink often, but when I do, Noodler’s and J. Herbin have been my inks of choice. Pilot Black measures up except that it is not quite as dark. 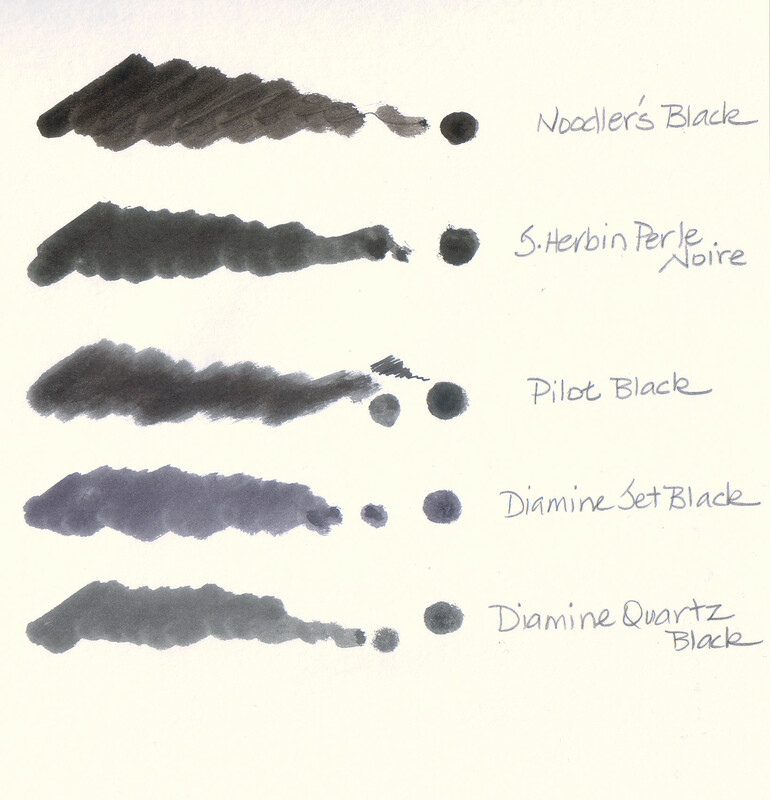 Noodler’s Black is warmer, Perle Noire is cooler and Pilot Black is more neutral. The differences are subtle, but Pilot Black works so well in the Namiki Falcon that the two will remain a pair whenever black is the right color for the occasion. Namiki comes in blue and black. Pilot is available in black, blue, red, and blue-black. The U.S price is $10-12 for a 60ml bottle of Namiki and $16.50 for a 70ml bottle of Pilot. Cartridges are available for both and in a variety of colors. The only weakness might be the shape of the bottle. The Namiki blue and black inks come in a squat one that is not well-suited to large nibs. A syringe or pipette will be needed to get the last drop. Pilot ink comes in a 30ml size but that’s hard to find in the U.S. The 70ml is a taller bottle and works well with larger nibs. Iroshizuku is a different ink to be sure but Pilot and Namiki are worth a look. No fancy bottles but just good quality ink, perfect for an inkophile. 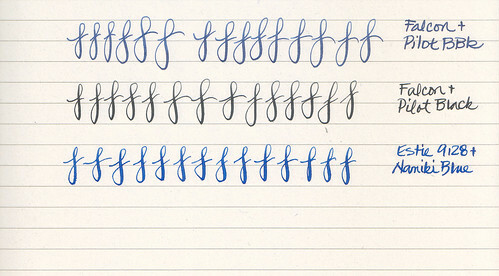 Loved seeing the “letter doodles” in this post. Alphabets, figure 8s, and swabs are expected in posts of this type. The extra image felt more organic, less formulaic. Maybe it’s because they aren’t all on the lines. Thanks for the surprise!